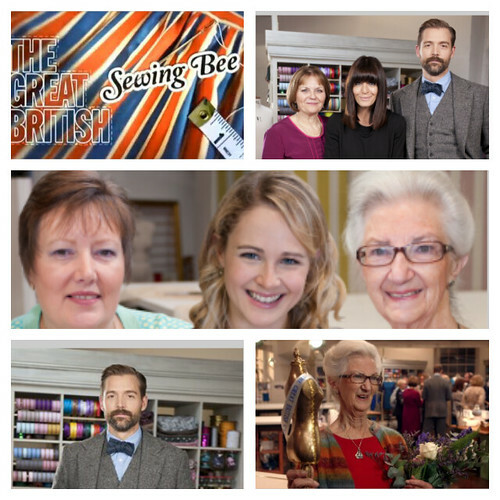 Did you see the final of the Great British Sewing Bee? It was wonderful! Being the final means that, sadly, it is now over, but there will be a second series!! Yay!! I have loved watching the 4 episodes, so much so that I watch them again when they repeat on Saturdays. The 3 pieces for last night involved - Making a mens shirt (4 hours): well done to Ann for having the best shirt (although she makes herself shirts all the time), and poor Lauren with her re-dos, but she finished! and I loved the fabric she used. Customising a felt handbag (90 mins): the sewing machine was off limits, so hand sewing only, sequins, beads, embroidery etc, Sandra's was my favourite. Making an evening gown (8 hours): LOVED this part. Off to the tea shop before starting the gown in the evening. Special models were bought in, Sandra and Ann daughters and Lauren's sister. Sandra used teal crepe backed satin, Lauren used duchess satin and sequin fabric, Ann used black lace layered over blue taffeta for a cocktail dress and hand stitched her zip in, always worth it with certain fabrics. Lauren was my clear favourite from the beginning, although Sandra's was beautiful. Ann's had a lot of work and prep work, but the dress wasn't my cup of tea, but a stunning creation. Then off for more cups of tea, whilst family and the other participants look over all their creations. Congratulations on becoming Britain's best amateur. I can't wait for series 2!! !